Decal from a Bog "Jumbo" Socket Set, ca. 1925-1929. 04/04/2019: Updated photo for Bog 202A ratchet. 04/02/2019: Added a Bog No. 673 1/2-Drive Flex Handle. 03/06/2019: Added a Bog 3/4-Drive 1-1/8 Hex Socket. 03/04/2019: Added 1928 corporation listings for Bog Manufacturing and National Auto Supply. 02/06/2019: "Speedy" is here! Added a Bog "Speedy" Nut-Holding Speeder. 02/01/2019: New discovery! The Bog "Speedy" speeder was listed in a 1922 Western Auto catalog! 01/31/2019: Edits to company history and catalog table. 01/30/2019: Updated catalog table, added a Catalog Listing for Bog "Dandy" 1/2-Drive Set. 01/29/2019: Minor reorganization, added a Catalog Listing for Bog Connecting Rod Wrench, a Catalog Listing for Bog Ford Flywheel Wrench, and a Catalog Listing for Bog "Multi-Fit" Socket Set. 01/28/2019: Added a Catalog Listing for Bog "Jumbo" Set. 05/08/2011: Added a Bog No. 3 "Knock-Off" Wheel Puller. 01/09/2011: Added a Bog 5/8 Offset Socket Wrench. 09/25/2009: Added a Bog [No. 496] 13/16x13/16 Box Socket Wrench. 09/24/2009: Added a Bog No. 637 1/2-Drive Sliding Tee Handle. 06/29/2009: Added a Bog 11/16 Offset Socket Wrench. 03/27/2009: Added a Bog 5/8 Speeder Socket Wrench. 08/20/2008: Added a Bog No. 690 Spark Plug Socket. 05/16/2008: Added a Bog 4-Way Lug Wrench. 03/22/2008: Added a Bog No. 814 Angled Connecting Rod Wrench. 11/15/2007: Added a Bog 1/2-Drive Extension. 11/03/2007: Added a Bog No. 202 1/2-Drive Ratchet. 11/02/2007: Added a Bog 1/2-Drive Socket Set. 10/08/2007: Added a Bog 1/2 Fixed Socket Wrench. 08/26/2007: Added a Bog 7/16 Fixed Socket Wrench. 05/25/2007: Added a Bog Triple-Socket Wrench. 02/21/2007: Added a Bog 3/8 Fixed Socket Wrench. 02/06/2007: Added a Bog 9/16 Fixed Socket Wrench. 12/16/2006: Added a Bog Reverse and Brake Ratchet. 11/14/06: Added a Bog Spark Plug Socket Wrench. 11/11/06: Added a Bog 7/16-Hex Drive Multi-Fit Socket Set. 11/03/06: Updated company history with connection between Bog and Western Auto. 10/29/06: Renumbered figures, minor edits. 10/08/06: Added a Bog 1/2-Drive 6-Point Sockets. 10/03/06: Added a Bog 328 Piston Ring Groove Cleaner. 08/30/06: New information! Bog products discovered in a 1929 Western Auto catalog! 07/30/06: Added a Bog 1/2-Drive Speeder. 07/27/06: Added a Bog 1721 Open-End Wrench. 07/09/06: The Jumbo is here! Added a 7/16-Hex "Jumbo" Socket Set. 07/07/06: Added a 7/16-Hex Drive Ratchet. 07/06/06: Added a 7/16-Hex Drive Speeder. 06/19/06: Added a No. 635 1/2-Drive Breaker Bar. 03/02/06: Added page with photos, no further info available yet. 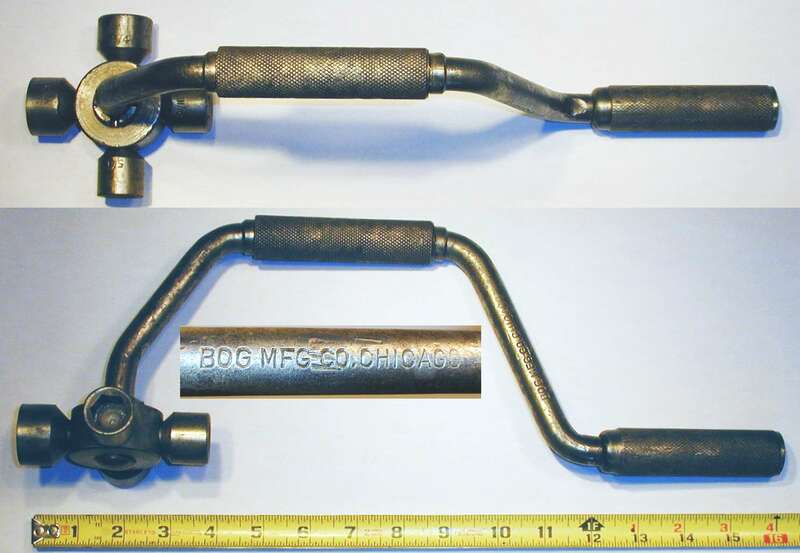 Bog Manufacturing was a somewhat obscure tool company in Chicago, active during the 1920s and 1930s, and with surprising connections to a major retailer and a major tool manufacturer. This page will explore the company's history and show examples of their tools. Even other tool experts, while familiar with tools marked "Bog Chicago", had no information about the company. Except for an industrial directory listing its address, it seemed that nothing in the public record could provide information about the company. Undaunted, we continued gathering examples of the tools and posting them to this article, confident that something would turn up. Our big break came after about six months, when we made a connection to the founder of Bog Manufacturing, and the key to the breakthrough was the discovery of Bog tools listed in Western Auto Supply catalogs. The 1927 and 1929 Western Auto catalogs list a wide variety of Bog automotive tools, with the name "Bog" identified in the text or clearly visible in the illustrations. These catalog listings, together with other information, provided a link between Bog and the Western Auto Supply company. It was previously known that a Ben Pepperdine had filed a patent for a Bog Ratchet, and that Western Auto Supply had been founded by a George Pepperdine. Given the supplier relationship between Bog and Western Auto, the matching surnames seemed unlikely to be a coincidence, and a search for Pepperdine family information confirmed that Ben and George were brothers. A web site for the Pepperdine family includes biographical information, and notes that Ben Pepperdine lived in Chicago and ran a company making hand tools for Western Auto Supply. Based on the above information, we can be reasonably certain that Bog Manufacturing was founded by Ben Pepperdine, and probably did most of its business with Western Auto Supply. Although the founding date is not yet known, our most recent search through the Western Auto catalogs has found a listing for the Bog "Speedy" Nut-Holding Speeder in 1922, confirming that the company was active by this time. Although the company name is not mentioned, the distinctive illustration matches the listing in a later Bog catalog. (The first mention of the Bog name is with a piston ring compressor shown in a 1924 Western Auto catalog.) The 1930 Donnelley's Industrial Directory listed the company's address as 2120 North Menard Avenue in Chicago. In addition to establishing the family connection between Bog and Western Auto, the Western Auto catalogs provide the most detailed information currently available for Bog products. Just the fact that Bog was a supplier to Western Auto is significant, as it means that the company must have had substantial volume manufacturing capabilities. It's worth mentioning though that Bog was not the exclusive supplier of tools for Western Auto. Western Auto sourced tools from many other suppliers, including Billings, Crescent, Duro/Indestro, Hinsdale, Herbrand, Vlchek, and J.H. Williams. Examples of production for Western Auto can be found in other articles on this site. Well after the above section was written, we did finally manage to acquire a catalog issued by Bog Manufacturing. The publication is entitled "Catalog No. 7 of Guaranteed Tools" and provides a more complete view of the company's products. Although not dated, it appears to have been issued in the mid 1920s, as the numerous references to Ford automobiles all seem intended for the Model T. The catalog lists the company's address as 2116-2124 North Menard Avenue in Chicago, which is consistent with the industrial directory listing mentioned earlier. As was mentioned above, the earliest known Bog tool listing from Western Auto is the "Speedy" nut-holding speeder in the 1922 catalog, and this tool was still available in the No. 7 catalog. The Bog products shown in the No. 7 catalog are quite similar to those listed in the 1927 and 1929 Western Auto catalogs. The Western Auto listings include sockets and drive tools, a double-stud ratchet handle, a ratcheting connecting rod wrench, numerous models of fixed socket wrenches and speeder wrenches, and several socket sets including the "Jumbo" model shown later in this article. It's likely that other Bog tools were offered as well, but the catalog illustrations and descriptions do not always indicate the manufacturer. Subsequently we were able to acquire several more Bog catalogs, and these show the progression of the company's development, as chrome-vanadium alloy tools and heavy-duty socket sets were added. Two other catalog references for Bog products are known, a 1928 catalog from the McMaster-Carr Supply Company and the 1931 catalog from the Samuel Harris Company. Both companies were Chicago-based industrial distributors, and the item listed is each case is the Bog No. 898 socket set in a metal case. Our catalog resources are summarized in the section on Catalog Coverage below. Based on the accumulated knowledge from catalogs and the numerous examples of tools, we can begin to piece together the development of the company. The company likely began operations shortly before 1922 and initially produced tools for Ford Model T service, items that were much in demand at the time. In addition to the "Speedy" Nut-Holding Speeder, these early tools would have included various fixed socket wrenches such as a Connecting Rod Wrench, a Reverse and Brake Band Wrench, a piston-ring compressor, and other similar items. A search of the 1923 Certified List of Domestic and Foreign Corporations (published by the Illinois Secretary of State) did not find an entry for Bog Manufacturing. However, there was an entry on page 886 for a National Auto Supply Company, with George Pepperdine and S.G. Miles listed as officers. The notice at the left shows the entry for the National Auto Supply Company at 1140 South Michigan Avenue in Chicago. Further checking found that in 1920 George Pepperdine took out a 15 year lease on a 6-story building at this location. 1927 Illustration of Bog Manufacturing Factory. This suggests the possibility that Bog might have started operations in space rented from George Pepperdine's facility in Chicago. But in any event, by 1927 Bog Manufacturing had a substantial factory operating at 2120 North Menard Street in Chicago. The scan at the left shows an illustration of Bog's factory from the back cover of the 1927 catalog. Sometimes the planned construction of a major building will generate public notices for the contracts, and it would be interesting to find some further information on the Bog factory. 1928 Listing for Bog Manufacturing at 2120 North Menard. With a little more searching we finally found a listing for Bog Manufacturing in the 1928 Certified List of Domestic and Foreign Corporations, at the expected address of 2120 North Menard Avenue. The scan at the left shows the entry for Bog, with Ben Pepperdine as President and O.J. McCalla as Secretary. 1928 Listing for National Auto Supply at 2116 North Menard. And as a nice bonus, the scan at the left from the same volume shows that George Pepperdine's National Auto Supply Company was now located in the adjacent building at 2116 North Menard Avenue! In the mid 1920s Bog began offering socket sets for automotive service, both in the industry-standard 1/2-drive and in 7/16-hex drive. The latter drive size was used for a series of compact sets with names like "Multi-Fit", "Dandy", and "Jumbo". By 1928 Bog was offering a new No. 600 C.V. socket set with chrome-vanadium sockets, as well as the Nos. 400 and 404 C.V. heavy-duty socket sets in 3/4-drive. These changes roughly mirrored developments at other Chicago-area tool companies (and competitors) such as Hinsdale and Duro/Indestro, although Bog was apparently ahead of the others in the move to 3/4-drive. In 1929 Bog began using the term "Chromium Vanadium" for its C.V. socket sets, possibly beginning a trend that saw Western Auto adopt "Chromium Vanadium" as a brand. The trend to alloy steel continued with an upgrade for the No. 898 set to chrome-nickel sockets. In 1930 Bog introduced double-hex ("double cornered hex") sockets, and also began offering "Chromium Vanadium" offset box wrenches. In the 1930s the company continued to develop towards professional and heavy-duty tools, although they continued to offer inexpensive consumer grade tools as well. By 1932 a line of 1.25-drive "Mammoth" socket tools was available, which raises a question as to Bog's available channels for tool sales. Tools of this size would be needed only in certain heavy industries such as oil exploration and production, but we haven't found any listings of these tools in industrial catalogs that might serve such customers. The later history of Bog Manufacturing has been a long-standing mystery until just recently. Western Auto catalogs from the mid 1930s continue to show some Bog tools, indicating that the company continued operations at least into the mid to late 1930s. However, no further references to Bog Manufacturing appear in trade publications after the 1930s. Ben Pepperdine and his family later relocated to Southern California, probably sometime in the 1940s, and it's not known whether the operations of Bog Manufacturing continued after this. It's possible that the manufacturing operations were moved, or that Bog might have been acquired by another company. There are at least some indications of a connection between Bog Manufacturing and the Plomb Tool Company during the 1940s and later. Bog is known to have assisted with Plomb's tool production during the war, as an example has been found of a Bog 202A ratchet marked as a Plomb WF-38. In addition, Ben Pepperdine assigned at least two patents to Plomb Tool, #2,518,173 filed in 1945 and #2,811,068 filed posthumously after Pepperdine's death in 1955. The hints and speculation in the previous paragraphs were finally resolved by the January 2010 discovery that by 1940 Bog Manufacturing had changed its name to the Cragin Tool Company. A 1940 directory of Illinois corporations (published by the Illinois Secretary of State) listed the Cragin Tool Company at 2120 North Menard Avenue, the same address used by Bog for many years, and the owners were listed as Ben and Dora Pepperdine. Readers familiar with the history of Plomb Tool will immediately recognize the name "Cragin Tool" as a 1940 acquisition by Plomb, and the recognition of Cragin Tool as the successor to Bog provides conclusive evidence that by 1940 the former Bog Manufacturing had become part of the Plomb family of companies. We can add a final footnote to Bog's later history with the October 2015 discovery that Cragin Tool was reorganized and renamed to form the Penens Corporation, a well known part of the Plomb family. (Penens had long been incorrectly reported as a separate acquisition by Plomb.) Penens continued to use the Menard Avenue factory until around 1948, when they moved to nearby Schiller Park. Penens later developed the Fleet and Challenger line of tools, and in the 1960s Penens was renamed to Fleet Tools. Examples of tools from the successor to Bog Manufacturing can be seen in our article on the Proto Empire. Several patents are known to have been issued to Ben Pepperdine and are summarized in the table below. There may be additional Pepperdine or Bog patents that have not yet been found. The last patent in the table (#2,811,068) was filed posthumously by his wife Dora after Ben Pepperdine's death in 1955. This patent (and the previous one as well) were assigned to the Plomb Tool Company. Bog Manufacturing is not known to have filed any trademark registrations. Bog's history takes place in a fairly compressed time frame, from 1922 to the late 1930s, so estimation of the manufacturing dates for tools is less critical than for companies with longer histories. Bog did not mark date codes on its earlier production, but by the mid 1930s some tools were being marked with a fairly obvious date code of the form MM-YY. (Why can't all companies use a code like this?) The earliest observed code thus far is for 1934. If we assume that the date code markings were applied to all tools after a certain date, then absence of the code would signify earlier production, e.g. 1922-1933. Information on the Pepperdine family was obtained from a web site at pepperdinefamily.org. In particular, the obituary for Ben Pepperdine's wife Dora May Pilkington (under "Histories") notes that Ben manufactured hand tools at his Chicago factory for Western Auto Supply. Information on the history and development of the Western Auto Supply company is available in The Last Western Flyer, published in 2004 by Jim Marchman. After a long drought of catalog information we were finally able to acquire several Bog catalogs from the late 1920s, all published as small booklets. The No. 7 catalog was undated but was likely published, possibly in late 1926, as a 1927 catalog edition. (See next paragraph for the rationale for the publishing date.) This 30-page mini-format publication shows the product line consisting of fixed socket wrenches, sockets and drive tools, and numerous specialty tools, including the "Speedy" nut-holding speeder. Bog catalog No. 8 is very similar to No. 7 but includes a few new products, and in addition provides a valuable clue to the publication date. Several new C.V. socket sets on two of the pages were stamped "Delivery Mar. 1st, 1928", apparently indicating that certain products were not quite ready at the printing date. Based on the stamped date, this catalog was likely published (possibly in late 1927) as the 1928 edition. The No. 8 catalog is 36 pages long (including front and back covers) and lists fixed socket wrenches, sockets and drive tools, and specialty tools. New items include sockets made of chrome-vanadium steel (misspelled as "Crome Vanadium") and socket sets in the 3/4-drive size. Catalog No. 29 is likely from 1929 and is generally similar to the previous editions, but the prices are given as dealer's net. This catalog uses the term "Chromium Vanadium" for the C.V. socket sets, a term later used by Western Auto as a brand. In addition, several Bog catalogs from the 1930s have been acquired. These Bog catalogs are summarized in the table below. No. 7 1927 Booklet Undated, likely published as the 1927 catalog edition. Includes "Multi-Fit", "Dandy", and "Jumbo" 7/16-hex drive socket sets. Includes No. 949 "Master" 1/2-drive socket set. Includes "Speedy" nut-holding speeder wrench. No. 8 1928 Booklet Undated, likely published as the 1928 catalog edition. Lists No. 600 C.V. socket set with chrome-vanadium sockets. Lists Nos. 400 and 404 C.V 3/4-drive sets with chrome-vanadium sockets. All new C.V. socket sets stamped "Delivery Mar. 1st, 1928". Includes No. 898 1/2-drive socket set, priced at $18.00. No. 29 1929 Booklet Undated, likely published as the 1929 catalog edition. No. 898 set now made with chrome-nickel sockets. "Chromium Vanadium" socket sets listed in 1/2-drive and 3/4-drive. No. 30 1930 Booklet Undated, likely published as the 1930 catalog edition. Double-hex ("double-cornered hexagon") sockets available. "Chromium Vanadium" offset box-end wrenches available. No. 132 1932 Full-size Undated, but included price list dated February 1932. "Chromium Vanadium" socket sets listed in 3/8-, 1/2-, and 3/4-drive. Offers socket tools in 1.25-drive "Mammoth" size! No. 37 1937 Half-size Angular and offset box-end wrenches available in sizes up to 1-13/16x2! Socket sets listed in 1/4-, 3/8-, 1/2-, 3/4-, and 1.25-drive. Bog tools were carried by at least two industrial distributors, and their catalogs provide helpful product information. In addition, a variety of Bog tools were offered by Western Auto Supply, and their catalogs are an important source of information. Western Auto Supply 1922. The 1922 Auto Supplies and Camping Equipment (Eastern edition) catalog from Western Auto Supply lists the Bog "Speedy" nut-holding speeder on page 118. The company is not identified, but the illustration is the same one used later in Bog catalog No. 7. This is our earliest catalog reference for Bog. Western Auto Supply 1924. The 1924 Ford Owners' Supply Book (Eastern edition) from Western Auto Supply lists a Bog piston ring compressor on page 92, a "Speedy" nut-holding speeder on page 116, and a "Dandy" wheel puller on page 117. Other Bog tools may be listed, but are not identified (or recognized) by maker. Western Auto Supply 1927. The 1927 Tires and Auto Supplies (Western edition) catalog from Western Auto Supply, a high-volume retailer, lists Bog tools on pages 56, 57, and 60. The listings include the "Multi-Fit", "Dandy", and "Jumbo" socket sets, various Ford service tools, and a valve lifter. Not all listings are identified by maker, so there may be additional Bog tools on other pages. McMaster-Carr 1928. The 1928 catalog No. 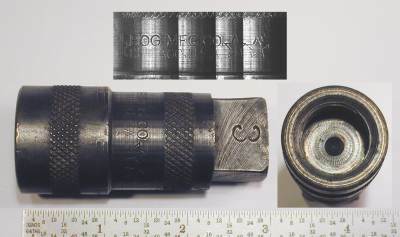 28 from the McMaster-Carr Supply Company, a Chicago-based industrial distributor, lists one socket set made by Bog, the No. 898 set. The catalog describes it as a "High Grade Wrench Set", and the contents include 19 hex sockets, 8 square sockets, and drive tools for a total of 35 pieces. The tools were finished with nickel plating and supplied with a black steel case, all for a price of $7.50 net. Incidentally, the pricing for this set shows the significant disparity between wholesale and list prices -- Bog offered the No. 898 set in its 1928 catalog for $18.00! Western Auto Supply 1929. The 1929 Auto Supplies for All Cars (Western edition) catalog from Western Auto Supply lists Bog tools on pages 81, 82, and 84. The listings include the "Multi-Fit", "Dandy", and "Jumbo" socket sets, various Ford service tools, and a double-stud ratchet handle. Not all listings are identified by maker, so there may be additional Bog tools on other pages. Western Auto Supply 1930. The 1930 Auto Owners' Supply Book (Eastern edition) from Western Auto Supply lists Bog tools on pages 100 to 102. The listings include fixed socket wrenches, the "Speedy" nut-holding speeder, the No. 814 connecting rod wrench, and the "Dandy" wheel and gear puller. 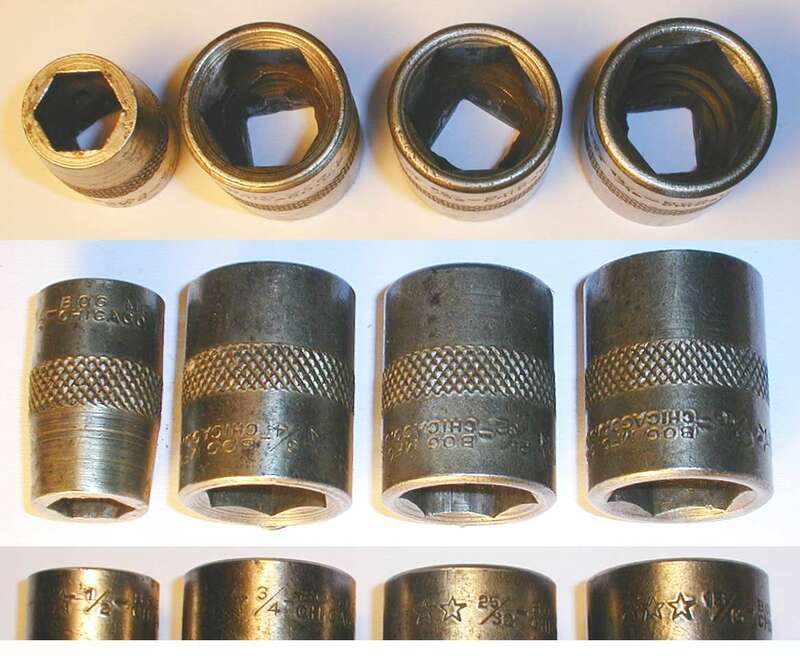 Some of the listings are not marked for Bog and require knowledge of the Bog catalogs for identification -- for example, the connecting rod wrench uses the term "12 Cornered Socket" known only from Bog. The 1930 Auto Supplies (Western edition) catalog from Western Auto Supply lists Bog tools on pages 85 to 87. The tools include a double-stud ratchet, connecting-rod wrenches, a universal, the Bog No. 415 4-way rim wrench, a number of fixed socket wrenches, and the "Multi-Fit", "Dandy", and "Jumbo" socket sets. Samuel Harris 1931. The 1931 Samuel Harris Company industrial supply catalog No. 57 lists a single Bog item, the No. 898 socket set. In this section we'll look at some examples of Bog tools, most of the which were probably originally sold through Western Auto Supply. Even though Bog published catalogs and was carried by some industrial distributors, the high-volume nature of the Western Auto retail business meant that they likely outsold the other channels. We'll begin with examples of fixed-socket (and related) tools, many of which were intended for service work on the Model T Ford. 1927 Catalog Listing for Bog "Speedy" Nut-Holding Speeder. One of Bog's earliest tools was a special nut-holding speeder socket wrench appropriately called the "Speedy" wrench. This tool was listed as early as 1922 in the Western Auto (Eastern edition) catalog, although not with any hint as to the maker. Fortunately, the "Speedy" wrench was still available in 1927, and the scan at the left shows the listing from page 30 of the 1927 Bog catalog. The text in the listing explains how the wrench works and lists the common applications for Ford Model T service. (Although the size isn't mentioned, Ford transmission cover bolts required a 9/16 socket.) The listings in the Western Auto catalogs used this same illustration, so we can be confident that they refer to the same tool. Tools of this type have an interesting history and were first offered by Walden, who based the design on an obscure patent for working on agricultural equipment. Walden acquired the patent and designed their adaptation as the Walden 6418 Nut-Holding Attachment, which could be fitted onto one of their long speeders. Blackhawk later copied Walden's idea as the Blackhawk 6218 Nut-Holding Speeder, and the Bog model is very similar to the Blackhawk tool. Bog offered the "Speedy" speeder in only the 9/16 size, but Walden and Blackhawk offered models for 1/2 nuts as well. Fig. 1. Bog "Speedy" 9/16 Nut-Holding Speeder Socket Wrench, with Inset for Marking Detail, ca. 1922 to Late 1920s. The overall length is 22 inches, and the finish is plain steel. This tool was listed in the 1922 Auto Supplies and Camping Equipment (Eastern edition) catalog from Western Auto Supply, without identifying the maker, but with the same illustration later found in the 1927 Bog catalog. The "Speedy" speeder is believed to be one of Bog's first tools. Fig. 2A. 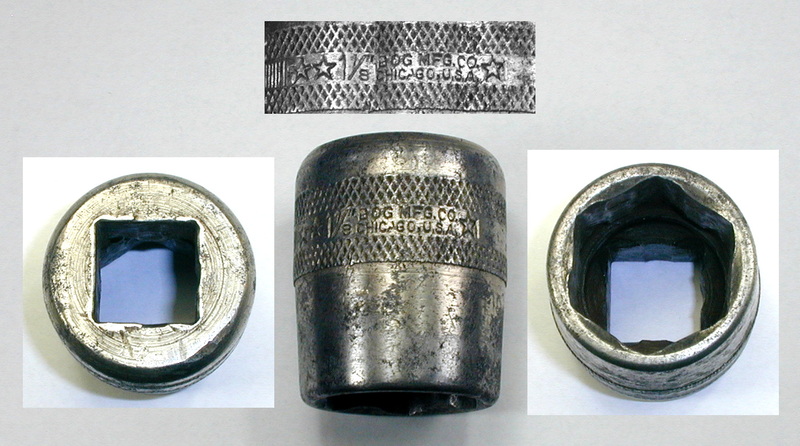 Bog 5/8 Speeder Socket Wrench, with Insets for Construction and Marking Detail, ca. Mid to Late 1920s. Fig. 2A shows a Bog 5/8 speeder socket wrench, stamped "Superior Bog Quality" on the shank. The overall length is 19.3 inches, and the finish is nickel plating. Bog speeder socket wrenches were listed on page 57 of the 1927 Tires and Auto Supplies (Western edition) catalog from Western Auto. The wrenches were available in sizes 1/2, 9/16, 5/8, and 3/4. Fig. 2B. Bog [T-306] 11/16 Ratcheting Box Wrench for Model T Reverse and Brake Bands, ca. Mid to Late 1920s. Fig. 2B shows a Bog [T-306] 11/16 ratcheting box wrench, stamped "Guaranteed Products" and "Bog Mfg. Co. Chicago, U.S.A." on the handle. Although not marked with a model number, it is listed as a model T-306 wrench in the Bog No. 7 catalog. The overall length is 6.6 inches. This type of ratcheting box wrench was a popular and familiar tool for Ford Model T owners, as it was commonly used for reverse and brake band adjustments. Similar models were made by a number of manufacturers, and an example by the Frank Mossberg Company can be seen as the Mossberg 645 Reverse and Brake Ratchet. 1927 Catalog Listing for Bog Connecting Rod Wrench. One of the most common specialty tools for servicing Ford automobiles was the connecting rod wrench. The scan at the left, from page 57 of the 1927 Western Auto (Western edition) catalog, shows a listing for a Bog Ford connecting rod wrench. The text notes its application for servicing the Ford fourth connecting rod. Fig. 3. Bog 5/8 Offset Socket Connecting Rod Wrench, with Insets for Construction and Marking Detail, ca. Mid to Late 1920s. Fig. 3 shows a Bog 5/8 offset socket wrench for Ford connecting-rod service, stamped "Bog Mfg. Co. Chicago" on the shank. The overall length is 12.3 inches, and the finish is black paint. The Ford Model T fourth connecting rod was infamous for its inaccessible location, making this tool a necessity for service. 1927 Catalog Listing for Bog Ford Flywheel Wrench. The Western Auto catalogs typically listed a number of specialty tools for servicing Ford automobiles. The scan at the left, from page 57 of the 1927 Western Auto (Western edition) catalog, shows a listing for a Bog Ford flywheel wrench. A close look at the illustration shows the text "Superior Bog Quality", matching the example in the next figure. Fig. 4. Bog 11/16 Offset Socket Wrench, with Insets for Construction and Marking Detail, ca. Mid to Late 1920s. Fig. 4 shows a Bog 11/16 offset socket wrench for Ford flywheel capscrews, stamped "Superior Bog Quality" on the shank. The overall length is 12.2 inches. The finish is plain steel with extensive pitting due to rust, but with a few traces of the original nickel plating. This wrench was designed to service the Ford Model T flywheel capscrews, which due to their awkward location required a special wrench with an offset shank. Several other companies produced similar wrenches, and examples can be seen as the Walden 3822 Socket Wrench and Blackhawk 4122 Socket Wrench. Earlier Ford service tools used an offset open-end wrench for this applications, such as the Herbrand 5Z-210 Flywheel Capscrew Wrench. Fig. 5. Bog (1/2x5/8)x5/8 Triple Socket Wrench, with Inset for Marking Detail, ca. Mid to Late 1920s. Fig. 5 shows a wrench popular for Ford Model T service, a Bog (1/2x5/8)x5/8 triple socket wrench, stamped "Bog Mfg. Co. Chicago" on the shank. The overall length is 9.2 inches, and the finish is nickel plating. Fig. 6A. Bog [No. 812] 5/8 Ratcheting Connecting Rod Wrench, with Inset for Marking Detail, ca. Mid 1920s to Late 1920s. Fig. 6A shows a Bog [No. 812] 5/8 ratcheting offset socket wrench intended for Ford connecting rod service. The barrel is stamped "Bog Mfg. Co. Chicago U.S.A." with the fractional size, as seen in the small inset. The overall length is 10.3 inches. This tool is listed on page 5 of the 1927 Bog catalog. This wrench is illustrated on page 57 of the 1927 Tires and Auto Supplies (Western edition) catalog from Western Auto. The illustration matches this tool and also appears to have "Bog" on the handle. Fig. 6B. Bog [No. 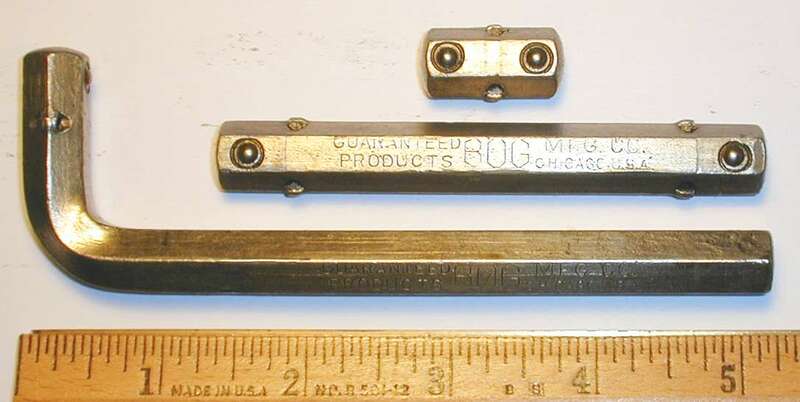 814] 5/8 Angled Socket Connecting Rod Wrench, with Insets for Side View and Marking Detail, ca. 1927-1930. Fig. 6B shows a Bog [No. 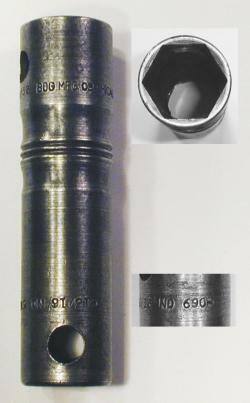 814] 5/8 fixed socket wrench with a double-hex broaching and a slightly angled handle, stamped "Bog Mfg. Co. Chicago" on the socket. The overall length is 7.3 inches, and the finish is nickel plating. 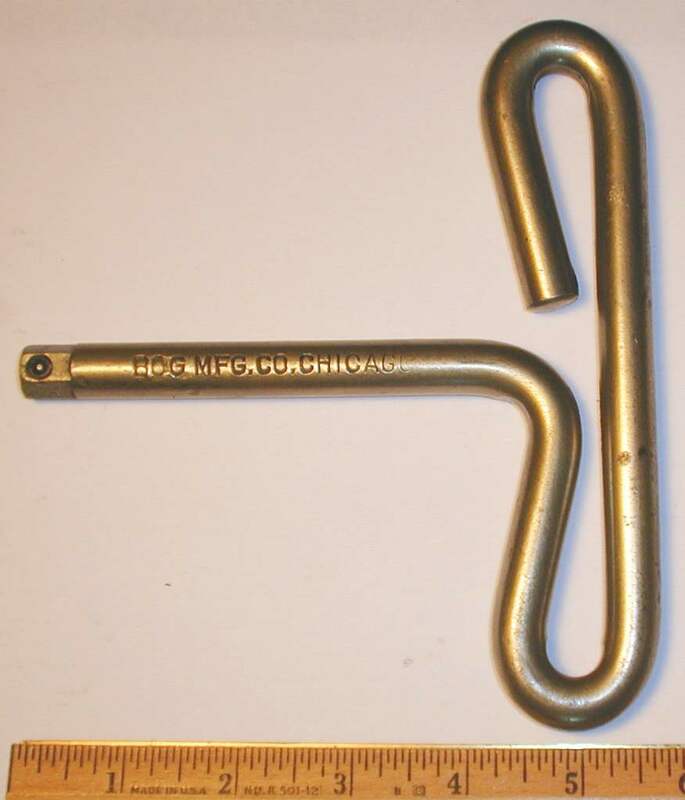 The double-hex broaching makes this an improved connecting rod wrench for Ford Model T service. This tool was listed on page 5 of the 1927 Bog catalog No. 7 and appears to be Bog's first tool with a double-hex socket. The 1932 Bog catalog No. 132 lists a similar No. 815 21/32 angled socket wrench for Ford Model A connecting rods. Fig. 6C. Bog [No. 496] 13/16x13/16 Box and Socket Wrench, with Insets for Side View and Marking Detail, ca. 1928 to 1930s. Fig. 6C shows a Bog [No. 496] 13/16x13/16 box and socket wrench, pairing a 13/16 hex socket with a 13/16 double-hex box opening. The wrench is stamped "Bog Mfg. Co. Chicago" on the shank. The overall length is 11.2 inches, and the finish is plain steel. Page 11 of the 1928 Bog catalog listed this wrench for Chevrolet service, noting that it fits the main bearing bolts, king bolt nuts, and spring bolt nuts. The next several figures show examples of Bog fixed socket wrenches with 12-point broachings. These wrenches were listed on page 31 of the 1930 Bog catalog as "Offset Head Wrenches" with "Double Cornered Hexagon" openings. Six sizes were available ranging from 5/16 to 5/8. Fig. 7. Bog [OW12] 3/8 Socket Wrench, with Inset for Broaching Detail, ca. 1930s. Fig. 7 at the left shows a Bog [OW12] 3/8 fixed socket wrench, marked "Bog Mfg. Co. Chicago" with "3-8" for the size. Fig. 8. Bog [OW14] 7/16 Socket Wrench, with Inset for Broaching Detail, ca. 1930s. Fig. 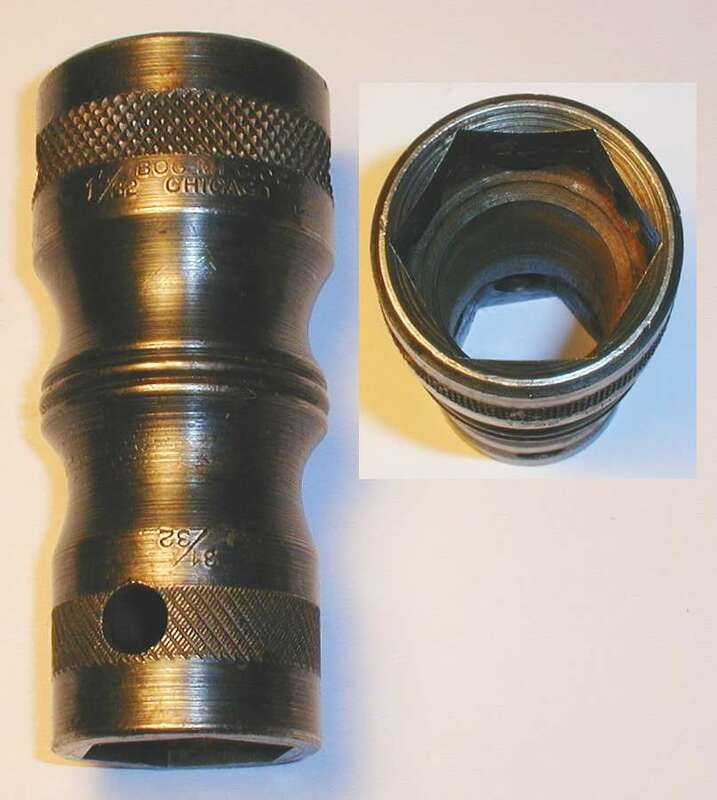 8 shows a Bog [OW14] 7/16 fixed socket wrench, marked "Bog Mfg. Co. Chicago" with "7-16" for the size. The overall length is 5.8 inches, and the finish is nickel plating, with loss due to rust. Fig. 9. Bog [OW16] 1/2 Socket Wrench, with Inset for Broaching Detail, ca. 1930s. Fig. 9 at the left shows a Bog [OW16] 1/2 fixed socket wrench, marked "Bog Mfg. Co. Chicago" with "1-2" for the size. The overall length is 6.2 inches, and the finish is plain steel, with traces of the original nickel plating. Fig. 10. Bog [OW18] 9/16 Socket Wrench, with Inset for Broaching Detail, ca. 1930s. Fig. 10 at the left shows a Bog [OW18] 9/16 fixed socket wrench, marked "Bog Mfg. Co. Chicago" with "9-16" for the size. The overall length is 6.8 inches, and the finish is nickel plating. Fig. 13. Bog No. 882 9/16x3/4 Socket Wrench, with Inset for Marking Detail, 1935. Fig. 13 shows a Bog No. 882 9/16x3/4 double-socket wrench, stamped "Bog Mfg. Co." with the fractional sizes and model number on the shank. The shank is also marked with a "3-35" date code for 1935. The overall length is 12.7 inches. Although not shown in the photograph, the socket openings are 9/16 square and 3/4 double-hex. The 1930 catalog Bog lists the No. 882 double-socket wrench for Ford Model A service, specifically the main bearing bolts and headlamp swivel bolt. During the 1920s and early 1930s Bog produced hex-drive socket sets in compact cases, likely intended for automobile owners. These sets were available in different sizes and were given names like "Multi-Fit", "Dandy", and "Jumbo". Although not stated in the catalogs, these sets used 7/16-hex drive for the sockets and tools. 1927 Catalog Listing for Bog Jumbo Socket Set. 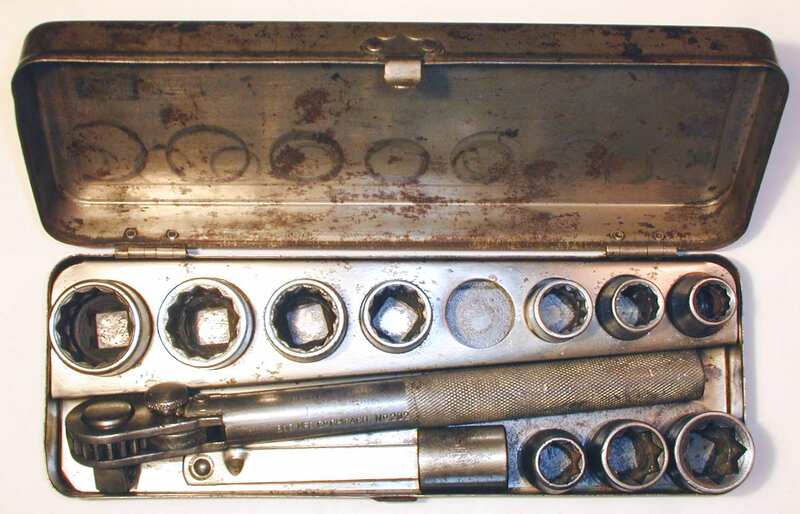 The largest of Bog's hex-drive sets was the "Jumbo" socket set, a collection of tools likely intended for automobile owners. The scan at the left shows an illustration and description for the "Jumbo" set from page 16 of the 1927 Bog catalog No. 7, providing us with an inventory of the tools in the set. 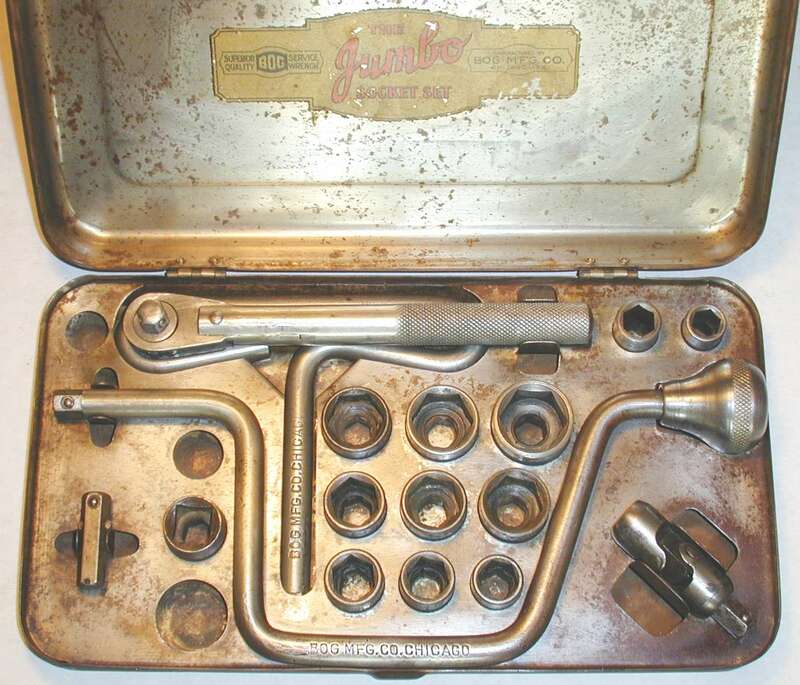 The "Jumbo" set featured 7/16-hex drive tools consisting of a ratchet, speeder, Tee-handle, extension, universal, and a valve grinding attachment. 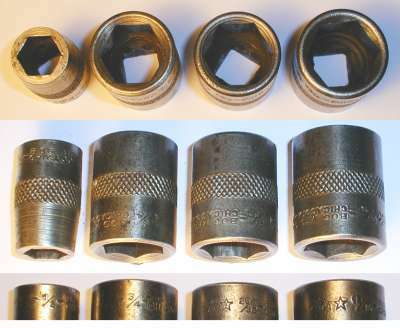 The sockets included 11 hex sockets with sizes from 7/16 to 15/16, three square sockets with sizes 7/16, 9/16, and 5/8, and one coupler socket. The "Jumbo" set was one of a number of Bog products offered in the 1927 and 1929 Western Auto Supply catalogs, and the corresponding Western Auto catalog listing can be seen with the Jumbo Set in our article on Western Auto. One striking difference between the two listings is the price -- the Bog catalog quotes a $14.00 list price, but Western Auto offered the set for just $6.85. We were fortunate to acquire a reasonably complete example of this unusual set, and the figures below will show the socket set and tools. Fig. 14. Bog "Jumbo" 7/16-Hex Drive Socket Set, ca. 1925-1929. Fig. 14 shows the Bog "Jumbo" 7/16-hex drive socket set in its metal case, consisting of a ratchet, speeder, Tee-handle, extension, universal, and a valve grinding attachment. The hex socket sizes are, starting in the top right corner, 7/16, 1/2, 9/16, 19/32, 5/8, 11/16, 3/4, 25/32, 13/16, 7/8, and 15/16. The three square sockets are stored to the left of the speeder, with sizes 7/16 (missing), 9/16, and 5/8 (missing). Based on the catalog description, our set appears to be missing the coupler socket (the upper left hole), two square sockets (7/16 and 5/8), and a double-male extension. The hex drive universal shown in the set was acquired separately, but is believed to be the correct tool, based on comparison with photographs of other "Jumbo" sets. The set was contained in a seamless metal case with a shelf of cutout holes to organize the tools. Fig. 15. Close-up of Decal from Bog "Jumbo" Socket Set, ca. 1925-1929. Fig. 15 shows a close-up of the decal from the "Jumbo" set. Fig. 16. Bog [No. 202] 7/16-Hex Drive Ratchet, ca. 1925-1929. Fig. 16 shows the 7/16-hex drive ratchet from the "Jumbo" socket set. Although not marked with a model number, this ratchet is identified as model No. 202 in the Bog catalog No. 7. The overall length is 7.8 inches, and the finish is nickel plating. Fig. 17. Bog [No. 206] 7/16-Hex Drive Speeder, with Inset for Marking Detail, ca. 1925-1929. Fig. 17 shows the Bog [No. 206] 7/16-hex drive speeder from the "Jumbo" set, stamped with "Bog Mfg. Co." and "Chicago" on the shank. This tool was listed as the No. 206 7/16-hex drive 12 inch speeder on page 9 of the 1927 Bog catalog. This speeder is similar to the Bog 1/2-Drive Speeder shown in another figure. Fig. 18. Bog [No. 210] 7/16-Hex Drive Tee Handle, ca. 1925-1929. Fig. 18 shows the Bog [No. 210] 7/16-hex drive Tee handle from the "Jumbo" set, stamped with "Bog Mfg. Co. Chicago" on the shank. The overall length is 5.7 inches, and the finish is nickel plating. This tool was listed as the No. 210 7/16-hex drive short Tee handle wrench on page 9 of the 1927 Box catalog. 1929 Catalog Listing for Bog "Multi-Fit" Socket Set. Bog also produced smaller socket sets in addition to the "Jumbo" model shown previously. The 1927 and 1929 Western Auto catalogs show a "Dandy" socket set of intermediate size, a "Multi-Fit" set in a very compact box, and a "Utility" set consisting of just sockets and an Ell-handle. The scan at the left shows the "Multi-Fit" set, as seen on page 84 of the 1929 Western Auto (Western edition) catalog. The set as illustrated consisted of a ratchet and drive plug, an Ell-handle, an extension, and six sockets. Note though that text has a couple of errors, as it lists seven sockets and doesn't mention the drive plug -- the ratchet was a new addition and one socket had to be removed to make room for the drive plug. Fig. 19. Bog "Multi-Fit" 7/16-Hex Drive Socket Set, ca. 1929. Fig. 19 shows a Bog "Multi-Fit" 7/16-hex drive socket set in its compact metal case, consisting of a ratchet and drive plug, an Ell-handle, an extension, and six sockets with sizes from 7/16 to 3/4. The set as shown matches the illustration in the 1929 Western Auto catalog, and in particular the ratchet is clearly illustrated. The "Multi-Fit" set in the 1927 Western Auto catalog did not include a ratchet, indicating that this particular set is a later example. An earlier version of the "Multi-Fit" set was illustrated on page 15 of the 1927 Bog catalog. At that time the set consisted of an Ell-handle, an extension, and seven sockets ranging in size from 7/16 to 7/8. Fig. 20. Bog 7/16-Hex Drive Ratchet, ca. 1929. Fig. 20 shows the 7/16-hex drive ratchet from the "Multi-Fit" set, marked "Bog Mfg. Co. Chicago U.S.A." and "Guaranteed Products". The overall length is 6.6 inches, and the finish is nickel plating. The ratchet is a simple non-reversible design constructed of laminated sheet steel. Fig. 21. Bog 7/16-Hex Drive Ell-Handle and Extensions, ca. 1929. Fig. 21 shows the Ell-handle, extension, and ratchet drive plug from the "Multi-Fit" set. The handle and extension are marked "Bog Mfg. Co. Chicago U.S.A." and "Guaranteed Products", and the small drive plug is unmarked. The overall lengths are 5.4, 3.8, and 1.0 inches respectively. Fig. 22. Bog 7/16-Hex Drive Sockets, with Inset for Broaching, ca. 1929. Fig. 22 shows the six 7/16-hex drive sockets from the "Multi-Fit" set, each marked "Bog Mfg. Co." and "Chicago, U.S.A." at the broached end. The sizes from the left are 7/16, 1/2, 9/16, 5/8, 11/16, and 3/4. The sockets have a coarsely-knurled band around the center, a convenience when turning the socket by hand. By the mid 1920s Bog was already offering sockets and tools with 1/2 square drive, even though its hex-drive tools were very popular at that time. Fig. 23. Bog 1/2-Drive 6-Point Sockets, with Insets for Broaching and Marking Details. Fig. 23 shows a group of four Bog 1/2-drive sockets, each marked with "Bog Mfg. Co." and "Chicago, U.S.A.", plus the fractional size. The sizes are, from the left, 1/2, 3/4, 25/32, and 13/16. The lower inset shows the fractional size markings flanked by five-pointed stars, a distinctive marking used by Bog. The number of stars marked varies from socket to socket, but usually both sides of the size have the same number of stars. The examples here have three stars except for the 1/2 socket, which has two. Indestro Manufacturing also marked its sockets with stars, but usually used only a single star on each side of the size. Fig. 24. Early Bog [No. 936] 1/2-Drive Ratchet, ca. Mid to Late 1920s. Fig. 24 shows a Bog [No. 936] 1/2-drive ratchet handle, marked "Bog Mfg. Co." and "Chicago, U.S.A." with "Guaranteed Products" at the top. Although not marked with a model number, this ratchet was listed as the No. 936 "Heavy Ratchet Handle" in Bog catalog No. 7. The ratchet is constructed of laminated sheet steel held together by rivets. Fig. 25. Bog 1/2-Drive Speeder, with Insets for Drive End and Markings, ca. 1925. Fig. 25 shows a Bog 1/2-square drive speeder stamped "Bog Mfg. Co. Chicago" on the shank, as shown on the inset. The overall length is 12.3 inches, and the finish is nickel plating. This speeder is similar to the Bog 7/16-Hex Drive Speeder shown in another figure. We recently acquired a Bog No. 955 "Junior" 1/2-drive socket set and are currently preparing it for display. Fig. 26. Bog No. 955 "Junior" 1/2-Drive Socket Set To Be Added. 1932 Catalog Listing for Bog "Dandy" Socket Set. In later years the Bog "Dandy" socket set was changed to 1/2 square drive and given an updated reversible No. 202 ratchet. The scan at the left shows a listing for the "Dandy" set from the 1932 Bog catalog No. 132. The set consisted of a reversible ratchet, an extension, 8 double-hex sockets, and 3 square sockets, all organized in a steel case. Note that although the description notes double-hex broachings, the illustration still shows hex sockets. The text also mentions the square drive shanks, a change from prior models with 7/16 hex drive. Fig. 27. Bog "Dandy" 1/2-Drive Socket Set, ca. 1930s. Fig. 27 shows a Bog 1/2-drive "Dandy" socket set in a metal case, consisting of a No. 202 reversible ratchet, an extension, eight double-hex sockets (with one missing), and three double-square sockets. Although the decal on inside cover has been lost, the set can be identified as the "Dandy" model from catalog listings, updated to use 1/2 square drive instead of the earlier 7/16 hex drive. The double-hex socket sizes are, from the right, 7/16, 1/2, 9/16, 5/8 (missing), 11/16, 3/4, 7/8, and 15/16. The double-square sockets in the front row have sizes, from the left, 7/16, 9/16, and 5/8. The construction and marking of the sockets is very similar to the Bog Hex Sockets shown above, but with double-hex (or double-square) broachings. The sockets and tools are organized in the case by a metal bracket with a hole punched for each socket. Fig. 28. Bog No. 202 1/2-Drive Reversible Ratchet, with Inset for Side View, ca. 1930s. Fig. 28 shows the 1/2-drive Bog No. 202 reversible ratchet from the "Dandy" socket set, stamped "Bog Mfg. Co. Chicago" on the shank. This ratchet has the same basic design as the earlier No. 202 7/16-Hex Drive Ratchet shown in the "Jumbo" socket set, but has been updated to be reversible by rotating the shift knob. In addition, the drive stud is now 1/2 square instead of the 7/16 hex found in earlier versions. The 1929 Bog catalog lists the No. 202 ratchet with a reversing lever and 1/2 square drive. Fig. 29. Bog 1/2-Drive 4 Inch Extension, ca. 1930s. Fig. 29 shows the Bog 1/2-drive 4 inch extension from the "Dandy" socket set, stamped "Bog Mfg. Co." and "Chicago, U.S.A." on the drive end. The overall length is 4.6 inches, and the finish is nickel plating. Fig. 30A. Bog No. 637 1/2-Drive Sliding Tee Handle, with Insets for Construction and Marking Detail, 1930s. The overall length is 9.6 inches, and the finish is chrome plating. This sliding Tee has some distinctive features worth noting here. The handle bar has a relatively large 11/16 diameter, compared with the 9/16 or 5/8 bar typically used for a tool of this drive size. Another uncommon feature is the threaded hole in the head for a locking thumbscrew, unfortunately missing when the tool was acquired. The unusual features of this tool were also noted in a nearly identical sliding Tee handle marked for Billings, allowing us to identify Bog as one of the contract manufacturers for Billings & Spencer. The Billings version of the tool can be seen as the Billings 5853 Sliding Tee. The model 637 sliding Tee was listed in the 1932 Bog catalog No. 132 as a "Combination Offset and Tee Handle" with a $1.00 list price. The 1937 Bog catalog No. 37 offered the 637 sliding Tee with a $1.65 price, and also listed the sliding head separately as a model 637B tool with a $1.00 price. Fig. 30B. Bog [No. 643] 1/2-Drive Double-Stud Gearless Ratchet, with Inset for Marking Detail, ca. 1929 to Late 1930s. Fig. 30B shows a Bog [No. 643] 1/2-drive gearless ratchet with a double-stud head, stamped "Bog Mfg. Co." and "Chicago" on the shank. This ratchet is listed as a No. 643 "Clutch Grip Ratchet Handle" in the 1929 Bog catalog, with a price of $3.25 (dealer net). The 1929 Western Auto (Western edition) catalog also shows a double-stud ratchet handle with an illustration matching this example. It was still listed in the 1937 Bog catalog. The next several figures show Bog tools with date codes, beginning with one marked for April, 1934. Fig. 31A. Bog No. 673 1/2-Drive Flex Handle, with Inset Marking Detail, 1934. Fig. 31A shows a Bog No. 673 1/2-drive flex handle, stamped "Bog Mfg. Co." and "Chicago" with a "4-34" date code. This is currently the earliest observed Bog date code. The overall length is 16.0 inches, and the finish is chrome plating. The handle has a hole for a cross-bar, to allow use as a Tee handle. One notable feature of this flex handle is the "outer-head" design, with the fork on the movable head rather than the handle. A number of companies used this design in the early 1930s to avoid infringing the Eagle patent #1,380,643, which described an "inner-head" flex handle with the fork at the end of the handle. In 1935 the Eagle patent was overturned after a lawsuit against P&C, and afterwards most companies switched to placing the fork on the handle. More information can be found in the section on the P&C Eagle Lawsuit. Fig. 31B. Bog No. 635 1/2-Drive Ell Handle, with Inset for Date Code, 1934. Fig. 31B shows a Bog No. 635 9 inch Ell handle, stamped with "Bog Mfg. Chicago U.S.A." and the model number on the shank, with a "9-34" date code on the reverse. The overall length is 9.3 inches, and the finish is chrome plating. The date code indicates production in 1934. Fig. 33. Bog 202A 1/2-Drive Reversible Ratchet, with Inset for Reverse, 1935. Fig. 33 shows a Bog 202A 1/2-drive reversible ratchet, stamped "Bog Mfg Co" on the shank, with "Pat. 1888885" and "Others Pend." on the reverse. The shank is also stamped with a "7-35" date code for 1935. The overall length is 9.7 inches, and the finish is chrome plating. The patent notice refers to patent #1,888,885, issued to Ben Pepperdine in 1932. The patent on this ratchet was one of the key links to rediscovering the connection between Bog Manufacturing and Western Auto Supply, founded by George Pepperdine. Fig. 34A. Bog No. 252 1/2-Drive Socket Set, with Inset for Date Codes, 1938. Fig. 34A shows an unusual Bog No. 252 1/2-drive socket set, listed on page 15 of the 1937 Bog catalog as a "Flex-Handle Barrel Wrench Set". The catalog description lists six sockets with sizes 7/16, 1/2, 9/16, 5/8, 11/16, and 3/4. Our example retains four of its sockets, each stamped with "Bog Mfg. Co." and a date code. The date codes are for late 1937 and early 1938. The clever design allows the sockets to be stored in the tapered handle, secured by a threaded cap. This next figure shows a rare example of Bog's 3/4-drive tools. Fig. 34B. Bog 3/4-Drive 1-1/8 Socket, with Insets for Drive End, Top View, and Marking Detail, ca. Late 1920s to Early 1930s. Fig. 34B shows a rare Bog 3/4-drive 1-1/8 socket, stamped "Bog Mfg. Co." and "Chicago, U.S.A." with the fractional size. The finish is nickel plating, with extensive losses due to wear and rust. This next figure shows an example of a Bog open-end wrench. Fig. 35. Bog 1721 Open-End Wrench, ca. Late 1930s. Fig. 35 shows a Bog 1721 5/16x3/8 open-end wrench, stamped with "Bog Mfg. Co." and "U.S.A." on one face. The overall length is 4.7 inches, and the finish appears to be nickel plate, now worn away in some areas. We haven't found a catalog reference for wrenches of this type, so we've tentatively identified this as later production. Fig. 36. Bog [No. 686] 31/32x1-5/32 Spark Plug Socket Wrench, with Inset for Broaching, ca. Mid 1920s. Fig. 36 shows a Bog [No. 686] 31/32x1-5/32 spark plug socket wrench, stamped "Bog Mfg. Co. Chicago" with the fractional sizes. Although not marked with a model number, this tool is listed as No. 686 in Bog catalog No. 7 of the mid 1920s. The wrench is drilled with cross-bar holes at both ends, and was originally supplied with a bent steel handle. The catalog description notes "Machined from solid bar stock ... Beautifully knurled, mottled, and case hardened." Fig. 37. Bog No. 690 13/16x29/32 Spark Plug Socket Wrench, with Insets for Broaching and Marking Detail, 1935. Fig. 37 shows another spark plug socket wrench, a Bog No. 690 with marked sizes 13/16x29/32. The wrench is stamped "Bog Mfg. Co. Chicago" and "8-35" (not shown) at one end, with the "No. 690" model number at the other end (see lower inset). The overall length is 4.3 inches. The "8-35" marking is a date code indicating production in 1935. Fig. 38. Bog No. 3 7/8-14 "Knock-Off" Wheel Puller, with Insets for End View and Marking Detail, ca. Late 1920s to 1930s. Fig. 38 shows a Bog No. 3[A] "knock-off" wheel puller for 7/8-14 wheel studs, stamped with "Bog Mfg. Co." and "Chicago U.S.A." on the body. The overall length is 2.8 inches, and the finish is black oxide. This type of tool was designed to protect the wheel stud bolts so that hammer blows could be used to loosen a wheel from a tapered axle shaft. Fig. 39. Bog [No. 415] 4-Way Multi-Socket Rim Wrench, with Insets for Top View and Marking Detail, ca. Late 1920s to 1930s. Fig. 39 shows a Bog [No. 415] 4-way brace socket wrench for servicing demountable rims or lug nuts, stamped "Bog Mfg. Co. Chicago" on the bend of the shank. The four sockets are permanently attached to the rotating carrier and have sizes 5/8, 11/16, 3/4, and 7/8. The overall length is 15.9 inches, and the finish is nickel plating. This tool was listed on page 18 of the 1929 Bog catalog, where the text calls it a "Big Boy Rim Wrench". The price was $2.65 dealer net. An example of a similar 4-way socket wrench can be seen as the Walden 1452 4-Way Rim Wrench, and a similar tool with a different socket mechanism can be seen as the Blackhawk 5104 4-In-1 Rim Wrench. A tool very similar to this was listed on page 57 of the 1927 Western Auto (Western edition) catalog as a "4-In-1 Rim Wrench" for a $3.45 price. However, the socket carrier and handle shape have a sufficiently different appearance to rule out Bog as the maker. In additon, the text mentions a locking capability, leading us to conclude that this rim wrench was likely made by the J.H. Faw Company, based on patents for a locking socket carrier. By 1929 the Western Auto (Western edition) catalog was offering a "4-In-1 Rim Wrench" with a socket carrier that closely resembles the Bog tool here. In addition, the shape of the handle in the illustration matches the photograph here and is different from the handle in the 1927 illustration. Although the description still mentions a locking capability, the text is identical to the earlier listing and thus is probably a cut-and-paste error. The 1930 Western Auto (Western edition) catalog also listed this tool with the same illustration and text. This tool can be seen in our article on Western Auto Supply as the Bog 4-Way Multi-Socket Rim Wrench, along with a catalog listing for the tool. Fig. 40. Bog No. 328 Piston Ring Groove Cleaner, ca. Late 1930s. Fig. 40 shows an example of the specialty tools produced by Bog, a No. 328 piston ring groove cleaner. The overall length is 10.2 inches, and the finish is nickel plating. This tool is fitted with a rotating scraper with four sizes, 3/32, 1/8, 5/32, and 3/16. The No. 328 tool was listed on page 35 of the 1937 Bog catalog.